Presenting your own company is a common part of pretty every business conference or sales or investor pitch. However, this is usually also the most boring part, as it is more about you and less about your audience. 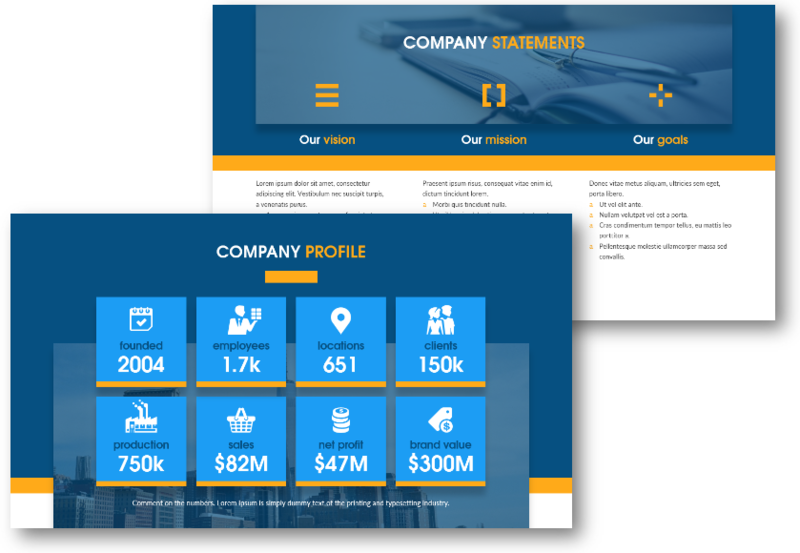 In this blog, you can find ideas on how to present your company profile and history in a powerful and attractive visual way. 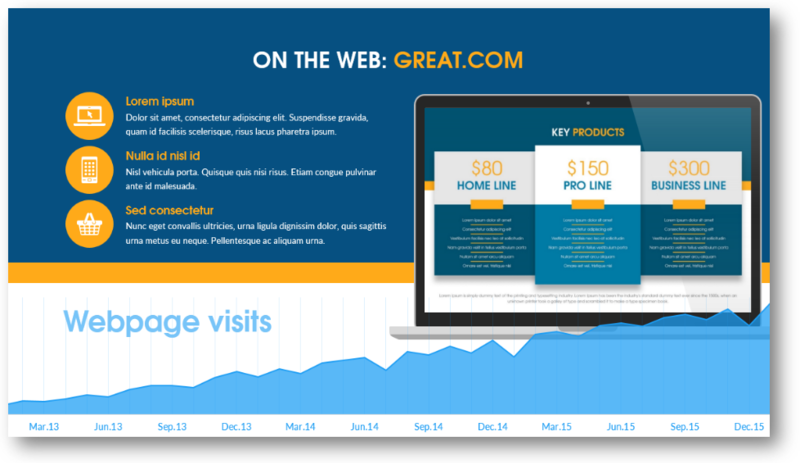 If you want to make a good impression, you have to stand out with your company slides. Apply storytelling approach. Illustrate them with clear and vivid visuals. Company presentation tip: Use WIIFM checkout – put yourself in shoes of the listener, who asks “What’s in it for me” with every slide she sees. To help you out with ideas on how to present company, we gathered ideas from presentations we seen and helped to design. Note: All pictures below can be found in Company Presentation Template and Slide Deck (see details by clicking the pictures). main products and services (can include website screenshots in case of online products). Let’s see a few variants of a graphical representation of those popular sections. This is the place, where a lot of people get stuck. Finding an idea for a title slide can be challenging. We advise to chose a simple picture for the background, which won’t distract people from the important – your presentation topic. It’s crucial to share your vision, that way you can show your passion and the company’s importance. And after this go straightly to numbers – nothing will tell the story better, than them. Limit it to max a dozen key numbers. Be ready to tell a short story behind each one, if asked about details. However, don’t put the details in your main presentation, as it can prolong your speech. Have them in the presentation notes or create back up slides. 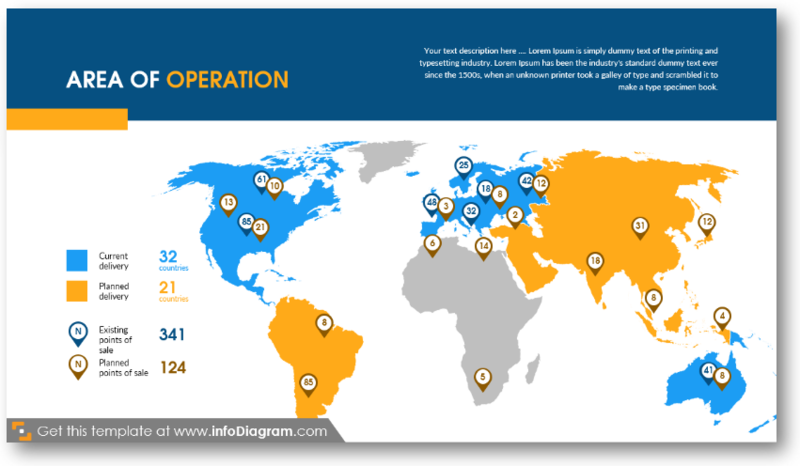 If you also want to show your country branches locations or point out new distribution points, add a map. Having a vector map, you can easily highlight regions or add pins to places you want to point to. Now it is time to get to the value that your company has – the products or services you offer. 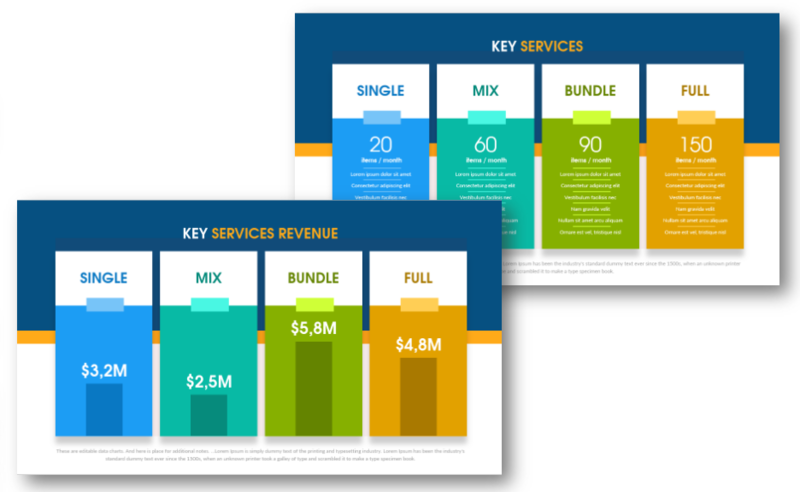 Better to place revenue slides right after and illustrate by bar or pie charts. It’s hard to find a company, which doesn’t have a website nowadays. 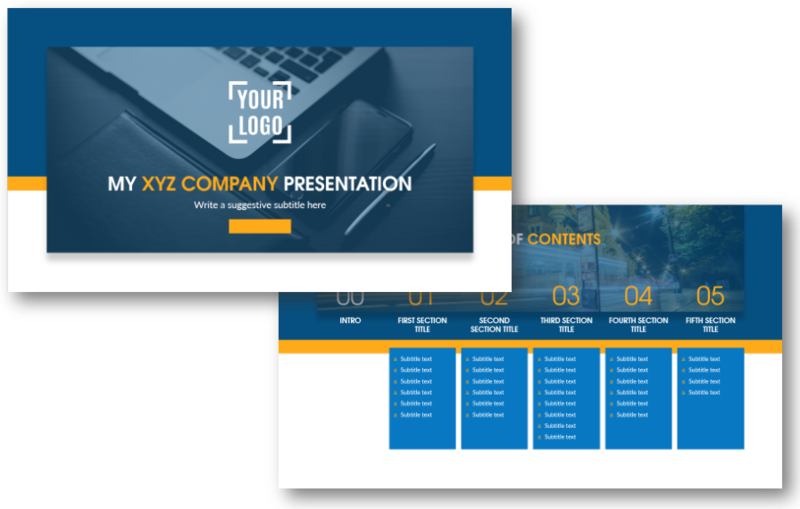 If you want to show it to your audience, don’t just make a print screen – use a laptop or mobile mock-up. That way is more professional. You can see three timeline slides: start and release, key milestones, events, awards and new products release. 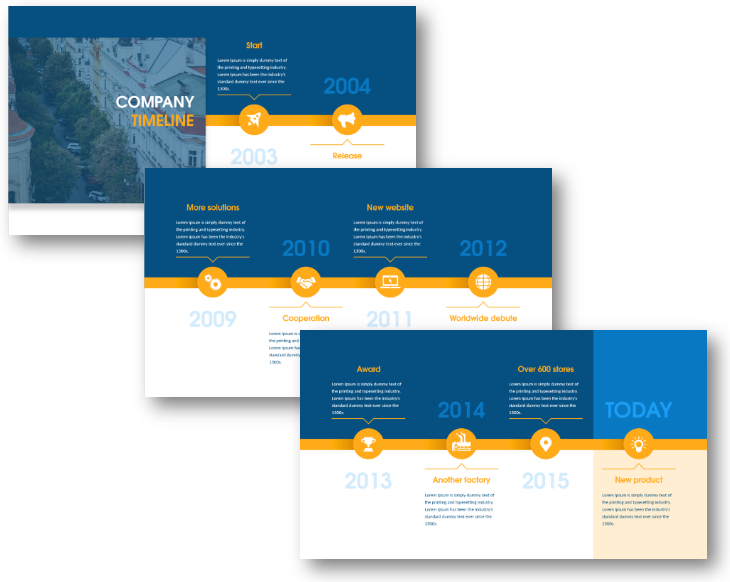 Look for other ways of presenting timelines here. Presentation advice: don’t talk about history too much, it is better to point out only main events and accomplishments. People like following the examples, so every company should have a face. This slide is about presenting the main figure of your company – everybody knows garage stories of Steve Jobs, Bill Gates or Jeff Bezos. 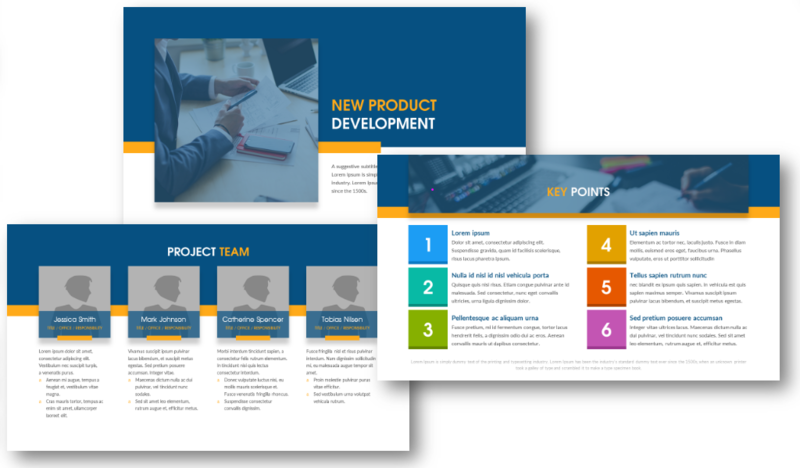 If you’re about to present revolutionary product, then take a look at slides above: one is for general product description, other presents the project team and the last one outlines key points (you can easily change the number of them). Sure your investors or partners would like to see some deadlines. 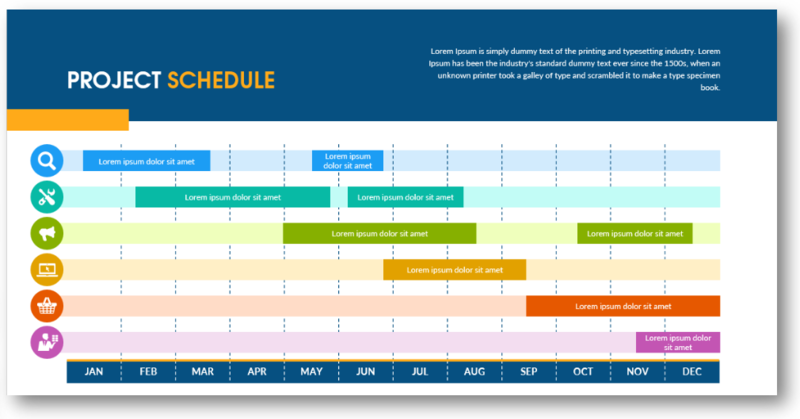 Gantt chart is proven management tool for scheduling project steps and watching deadlines. Here’s an example of how you can place the information about your existing clients. Or potential ones in the case of releasing new product or entering new markets. 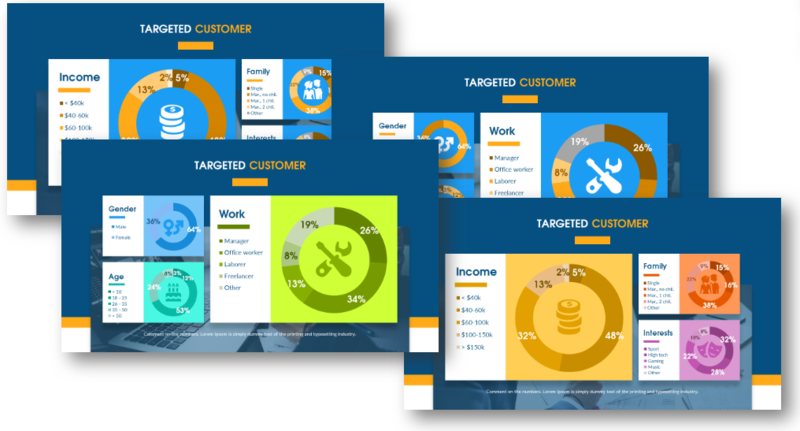 The good idea is to show this information as pie charts and illustrate them with simple icons. Design tip: better split statistical data into several charts, don’t use too many indexes in one chart. No matter how awesome your product or service is (and we are sure it is 🙂 ), acknowledging your competitors is a must-do task. As Jean Baudrillard said: ‘Information can tell us everything. It has all the answers’. 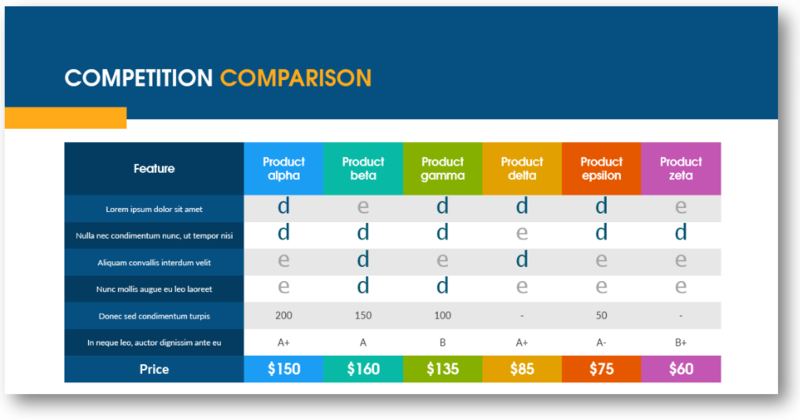 Organizing your competitors’ product features inside a table will allow you to see their weak points and underline your strengths. Put your main insight or idea on it for people to remember. 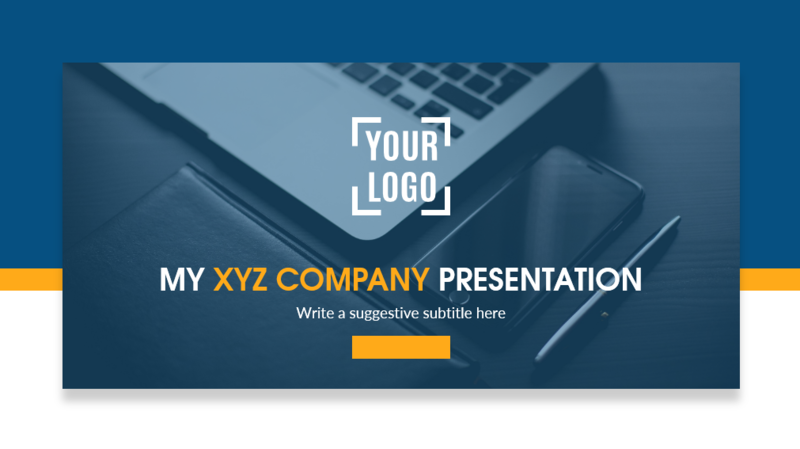 To sum up, we presented you a bunch of ideas for various company presentation parts. From the title, navigation slide, throughout a company philosophy and profile, timeline, owner or managing directors biography, main products, information about future developments and market intelligence. 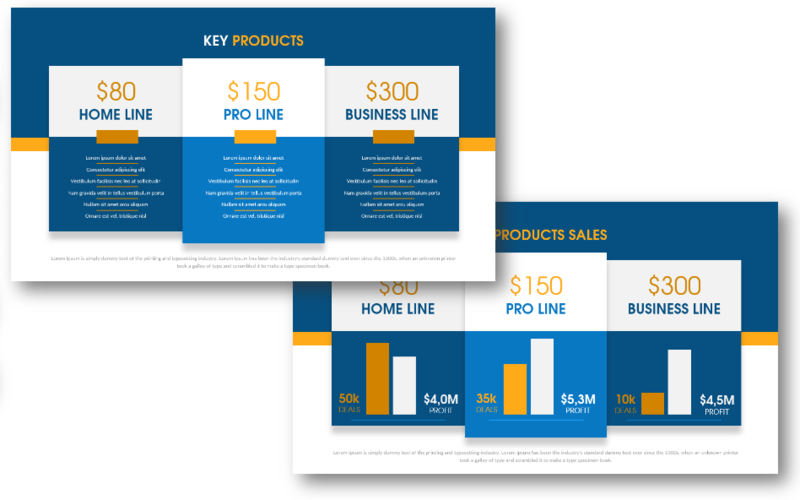 If you decide to use the PowerPoint template to create your slides, all these graphics are available in the editable form here. 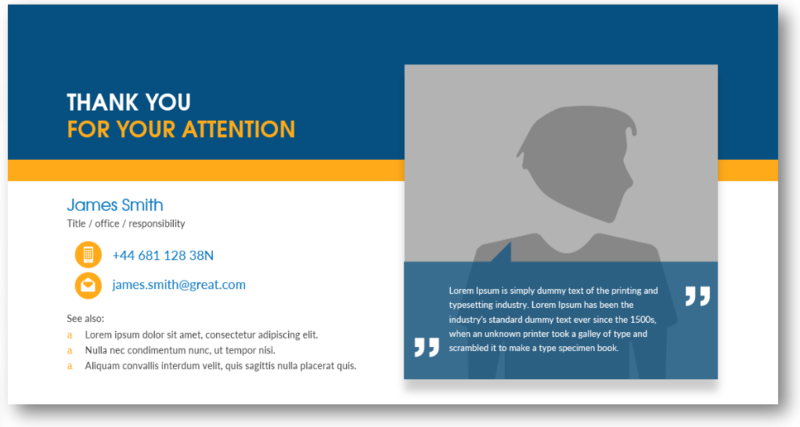 Our pre-designed PPTX template contains a slide for each presentation part mentioned above. 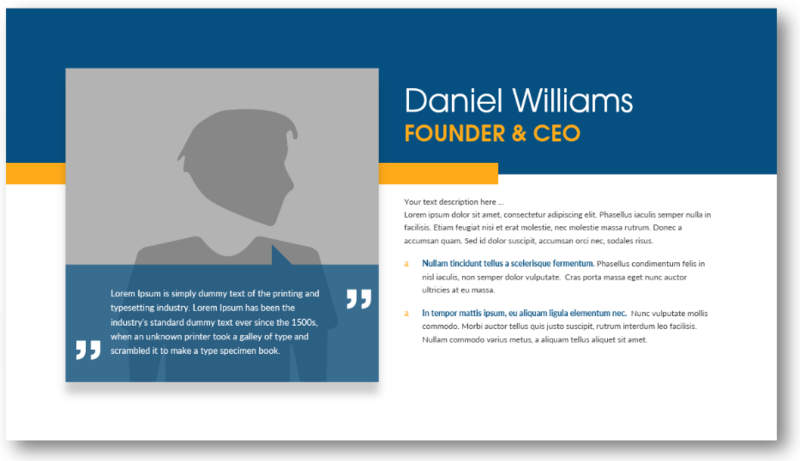 What’s inside Company Presentation Deck? If you need to present more detailed business or market analysis, see our Business & Marketing section, where you’ll find diagrams from the SWOT model to HR topics illustration.